The physical devices that a computer is made of are referred to as the computer's hardware. The programs that run on a computer are referred to as software. The term hardware refers to all of the physical devices, or components, that a computer is made of. A computer is not one single device, but a system of devices that all work together. Like the different instruments in a symphony orchestra, each device in a computer plays its own part. Let's take a closer look at each of these components. 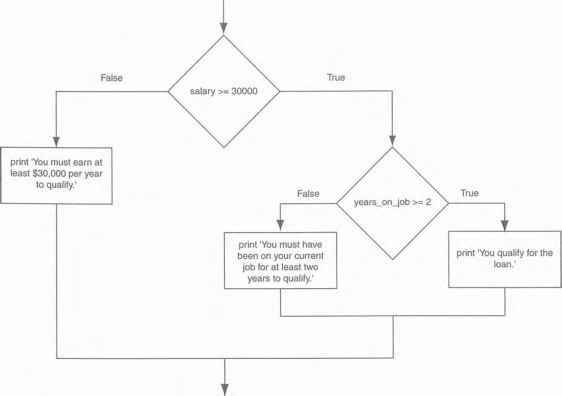 When a computer is performing the tasks that a program tells it to do, we say that the computer is running or executing the program. The central processing unit, or CPU, is the part of a computer that actually runs programs. 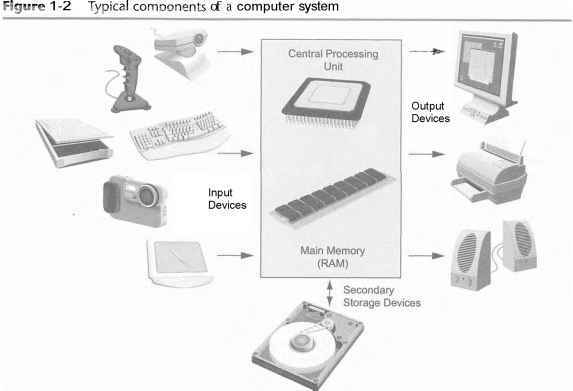 The CPU is the most important component in a computer because without it, the computer could not run software. In the earliest computers, CPUs were huge devices made of electrical and mechanical components such as vacuum tubes and switches. 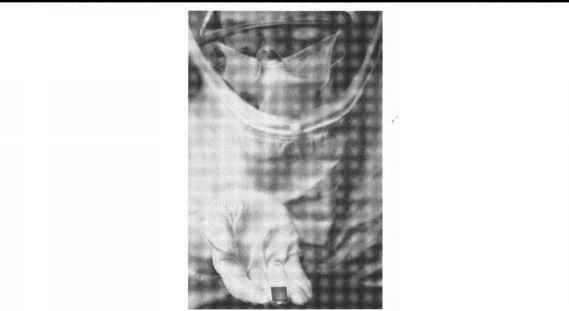 Figure 1-3 shows such a device. 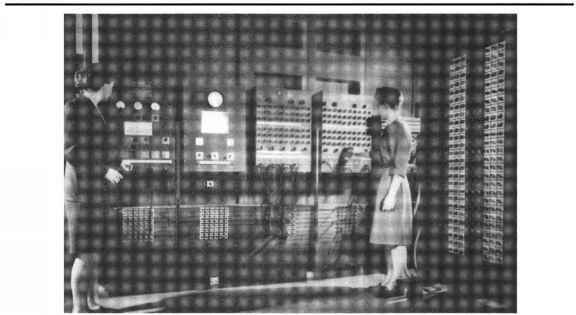 The two women in the photo are working with the historic ENIAC computer. The ENIAC, which is considered by many to be the world's first programmable electronic computer, was built in 1345 to calculate artillery ballistic tables for the U.S. Army. This machine, which was primarily one big CPU, was 8 feet tall, 100 feet long, and weighed 30 tons. Today, CPUs are small chips known as microprocessors. Figure 1-4 shows a photo of a lab technician holding a modern microprocessor. In addition to being much smaller than the old electromechanical CPUs in early computers, microprocessors are also much more powerful. You can think of main memory as the computer's work area. This is where the computer stores a program while the program is running, as well as the data that the program is working with. For example, suppose you are using a word processing program to write an essay for one of your classes. While you do this, both the word processing program and the essay are stored in main memory. Main memory is commonly known as random-access memory, or RAM. It is called this because the CPU is able to quickly access data stored at any random location in RAM. RAM is usually a volatile type of memory that is used only for temporary storage while a program is running. When the computer is turned off, the contents of RAM are erased. Inside your computer, RAM is stored in chips, similar to the ones shown in Figure 1-5. Secondary storage is a type of memory that can hold data for long periods of time, even when there is no power to the computer. Programs are normally stored in secondary memory and loaded into main memory as needed. Important data, such as word processing documents, payroll data, and inventory records, is saved to secondary storage as well. In addition to external disk drives, many types of devices have been created for copying data, and for moving it to other computers. For many years floppy disk drives were popular. A floppy disk drive records data onto a small floppy disk, which can be removed from the drive. Floppy disks have many disadvantages, however. They hold only a small amount of data, are slow to access data, and can be unreliable. The use of floppy disk drives has declined dramatically in recent years, in favor of superior devices such as USB drives. USB drives are small devices that plug into the computer's USB (universal serial bus) port, and appear to the system as a disk drive. These drives do not actually contain a disk, however. They store data in a special type of memory known as flash memory. USB drives, which are also known as memory sticks and flash drives, are inexpensive, reliable, and small enough to be carried in your pocket. Optical devices such as the CD (compact disc) and the DVD (digital versatile disc) are also popular for data storage. Data is not recorded magnetically on an optical disc, but is encoded as a series of pits on the disc surface. CD and DVD drives use a laser to detect the pits and thus read the encoded data. Optical discs hold large amounts of data, and because recordable CD and DVD drives are now commonplace, they are good mediums for creating backup copies of data. Input is any data the computer collects from people and from other devices. The component that collects the data and sends it to the computer is called an input device. Common input devices are the keyboard, mouse, scanner, microphone, and digital camera. Disk drives and optical drives can also be considered input devices because programs and data are retrieved from them and loaded into the computer's memory. Output is any data the computer produces for people or for other devices. It might be a sales report, a list of names, or a graphic image. The data is sent to an output device, which formats and presents it. Common output devices are video displays and printers. Disk drives and CD recorders can also be considered output devices because the system sends data to them in order to be saved. If a computer is to function, software is not optional. Everything that a computer does, from the time you turn the power switch on until you shut the system down, is under the control of software. There are two general categories of software: system software and application software. Most computer programs clearly fit into one of these two categories. Let's take a closer look at each. Operating Systems An operating system is the most fundamental set of programs on a computer. The operating system controls the internal operations of the computer's hardware, manages all of the devices connected to the computer, allows data to be saved to and retrieved from storage devices, and allows other programs to run on the computer. 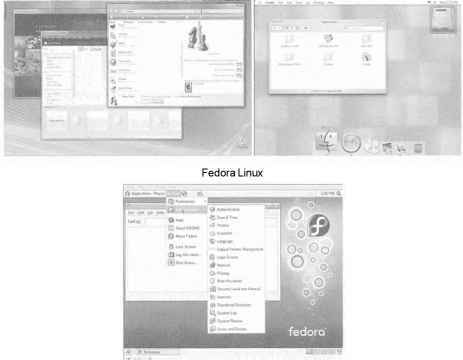 Figure 1-6 shows screens from three popular operating systems: Windows Vista, Mac OS X, and Linux. Utility Programs A utility program performs a specialized task that enhances the computer's operation or safeguards data. Examples of utility programs are virus scanners, file compression programs, and data backup programs. Software Development Tools Software development tools are the programs that programmers use to create, modify, and test software. Assemblers, compilers, and interpreters are examples of programs that fall into this category. Programs that make a computer useful for everyday tasks are known as application software. These are the programs that people normally spend most of their time running on their computers. Figure 1-1, at the beginning of this chapter, shows screens from two commonly used applications: Microsoft Word, a word processing program, and Adobe Photoshop, an image editing program. Some other examples of application software are spreadsheet programs, email programs, web browsers, and game programs. 1.3 List the five major components of a computer system. 1.4 What part of the computer actually runs programs? 1.5 What part of the computer serves as a work area to store a program and its data while the program is running? 1.6 What part of the computer holds data for long periods of time, even when there is no power to the computer? 1.7 What part of the computer collects data from people and from other devices? 1.8 What part of the computer formats and presents data for people or other devices? 1.9 What fundamental set of programs control the internal operations of the computer's hardware? 1.10 What do you call a program that performs a specialized task, such as a virus scanner, a file compression program, or a data backup program? 1.11 Word processing programs, spreadsheet programs, email programs, web browsers, and game programs belong to what category of software? What fundamental set of programs control the internal operations of the computer's hardware?